Registrations are now open for the 4th edition of the Hacking de l’Hôtel de Ville, on March 16th. Sign up to the international event that brings together innovation stakeholders in Paris. 1,100 start-ups, 75 countries, 200 investors, 200 international experts, 50 large companies as well as 90 deputies to the Mayor of Paris and agents of the City. Take part in the large "Startup MeetUp" event and in one of the 3,300 business meetings being held on the day. Step into the Mayor’s tribune to make 3-minute project pitches, with the goal of convincing an audience of 200 investors and corporates. Take part in the Reverse Business Pitch of large corporations. Get involved in the workshops to cease current issues ans the upcoming initiatives by the City of Paris. 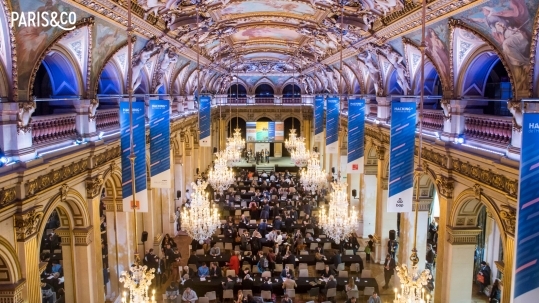 Under the majestic ceilings of the Paris City Hall called “la Salle des Fêtes”, startups, experts, French and international corporates, institutional players, investors and buyers from the City of Paris will participate in the largest MeetUp in Paris. The sound of the gong will mark 15-minute intervals, letting you participate in one – or several – of the 3,300 business meetings scheduled that day. This large-scale speed dating event is a great way to connect with future partners, clients, experts and investors. In the iconic Council Chamber of Paris, French and foreign startups (selected through an application process) step into the Mayor’s tribune to make 3-minute project pitches, with the goal of convincing an audience of 200 investors and corporates. Two distinct pitch sessions have been organized by 50 Partners: in the morning, 25 startups raising less than 1M€ in funds will present their project; in the afternoon, 25 startups raising more than 1M€ will take the reins. During a Reverse Pitch session in the Council Chamber of Paris, startups and corporates switch places. 7 large and mid-sized corporations will have 10 minutes to present their strategies and goals for future business development and/or launch a call to innovation, in front of an audience of young entrepreneurs in the benches. The perfect opportunity to learn more about key corporate players’ development trends, and to challenge their innovation projects. Game-changing innovations, French and foreign startups and global corporates take over City Hall to showcase the digital diversity of tomorrow. On the agenda: spectacular innovations in the music and creative industries, as well as in mobility and sustainable development. You’ll get to discover and test virtual and augmented reality technologies, attend demos and participate in immersive experiences. 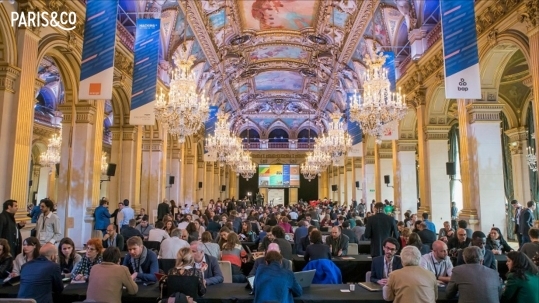 In the “Salon Laurens”, a series of 45-minute thematic workshops will inform startups about business development and the next-generation needs of the City of Paris : mobility, public bids, short-term markets for the 2024 Olympic Games, international development, sustainable financing and green funds. Experts and public officials will share new market opportunities and explore avenues for business development through the prism of sustainable development and positive impact. Registrations are now open for the 5th edition of the Hacking de l’Hôtel de Ville, on March 21st. Apply now for the DemoSpace or Xperiment Show 2019 and benefit from a free space in the heart of the Paris City Hall salons.